I am honored to be here tonight from the Cathedral of the Incarnation in Garden City. The cathedral has served as a House of Prayer for Long Island since 1885. That’s 14 years before Nassau became a county. Since 1977, The Episcopal Church has ordained openly LGBTQ people. In 2003, we consecrated our first openly gay bishop, and since 2009, The Episcopal Church has officially offered the rite of sacramental marriage to LGBTQ couples. New York State caught up to us on marriage in 2011. 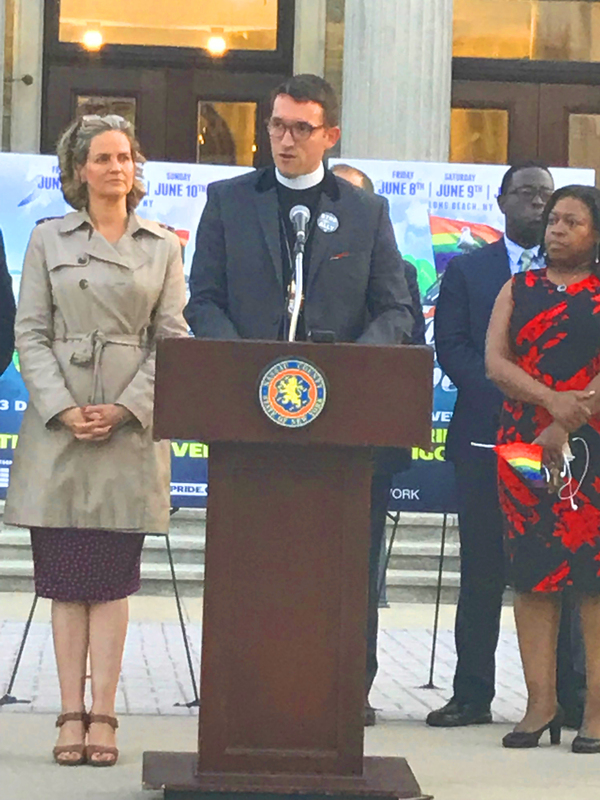 Tonight, I bring the support and blessing of the Bishop of Long Island and our diocese as we celebrate the diversity of this county and light the dome in the colors of the rainbow. Long Island Pride Weekend is a time to celebrate the many gifts expressed in our LGBTQ community. These gifts are too varied and numerous to mention, but I would be remiss if I did not say that church music programs of every tradition across Long Island and across the world have relied upon the giftedness of LGBTQ people for centuries - even as so many have been forced to serve in the darkness of the closet. The fight for the full inclusion of LGBTQ people in all aspects of public and religious life is not over. On this day, in this place, we honor the lives, the relationships, the talents, the generosity, and the struggles of LGBTQ Long Islanders. We give thanks for them out loud and proud in front of this Executive and Legislative building named for Theodore Roosevelt. Theodore Roosevelt who said, “It is only through labor and painful effort, by grim energy and resolute courage, that we move on to better things.” At this first Nassau County pride flag raising, we give thanks that by the often painful effort and resolute courage of LGBTQ people and their allies, we are moving on to better things for our whole community. This…is what the glory of the Lord looks like to me. Let us pray: God of love, you have given the human family the gift of diversity. Help us always to honor you with reverence for the many ways love is expressed in our community. Bless us all with passion, compassion and a commitment to strive for better things. May this pride weekend be a time of celebration and joy as we give thanks for each other. May all LGBTQ Long Islanders see and know that they are of sacred worth, and immeasurable value. All this we ask in your most holy name. AMEN.